Our first game of round nineteen saw SFA hopefuls Moreland take on bottom of the table who were coming off a good win last week. It would be the Blues to open the scoring as Rebecca Saber struck first, before Saber added to her tally to double the advantage. Saber looked in the mood early in this game as she completed her hat trick before adding a fourth to her tally as Moreland would lead 4-0 going into the half time break. The second half was more one sided for the Blues as they added the next five goals through a pair of braces from Tayla Mure & Daniella Galluccio, whilst first gamer Kassandra Stabb also got her first SFV goal for a 9-0 lead. A stunning finish from Ella Sowinska got Balwyn their first goal of the night, but it would only be a consolation as Saber added her fifth of the game to seal victory and ensure Moreland remained in second place for another week. Next up saw Preston looking to capitalise on Balwyn’s defeat earlier as they took on Pascoe Vale. It was a slow start to the game, but the Lions got off to the better start as Anita Odd finished a good counter attack for the opener. Preston would draw level though through Armina Sherifi to go into the half time break level at a goal a piece. Pascoe turned it up a gear in the second half as they added seven goals to one, Odd finishing with a game high four goals, while Evangelia Parthimos chipped it with three of her own. Jasmine Lazarevski got a late consolation for the Panthers but it was only a consolation as they fell to a strong Pascoe Vale outfit. Next up saw Fitzroy on the verge of a championship, just need a victory to seal it with Western Wolves standing in their way. It was a tight start to the game but Fitzroy got the opening goal through an Erin Clout toe poke and it remained the only goal of the half thanks to some amazing goal keeping from Aisha Atik keeping the score at one. The Tigers opened the second half on the front foot and capitalised on a defensive error which saw Em Coppock find the net to double the advantage, before Sarah Richardson was initially denied by Atik but lashed home the rebound for a three-nil lead. Coppock would get two more late goals to complete her hat trick and seal the victory which proves a historic one as Fitzroy claims its first championship. The final game of the evening saw Melbourne Amazons take on Carlton. With SFA on the line a win was crucial for Carlton and they put in a solid first half showing as they struck five goals to one with new inclusion Steph Galea grabbing a brace and Jess Byrne, Rebecca Drew & Katie Foster all chipping in with singles, while Simone Grishwood kept up her scoring form striking for the Amazons. 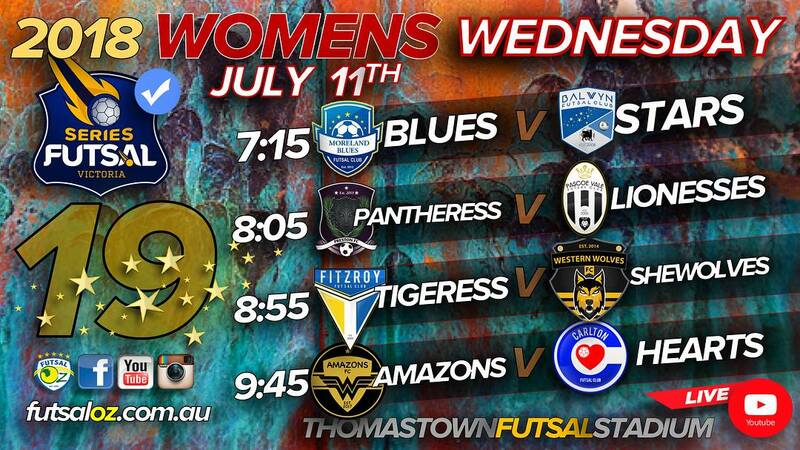 It was the same story in the second half as the Heart were in complete control adding another five goals to one with Galea completing a hat trick as well as Claudia Johns getting a second half double and Foster and Drew adding to their tallies to finish the game with two each in what was a convincing display from the Heart as they remain in the running for a Series Futsal Australia birth.